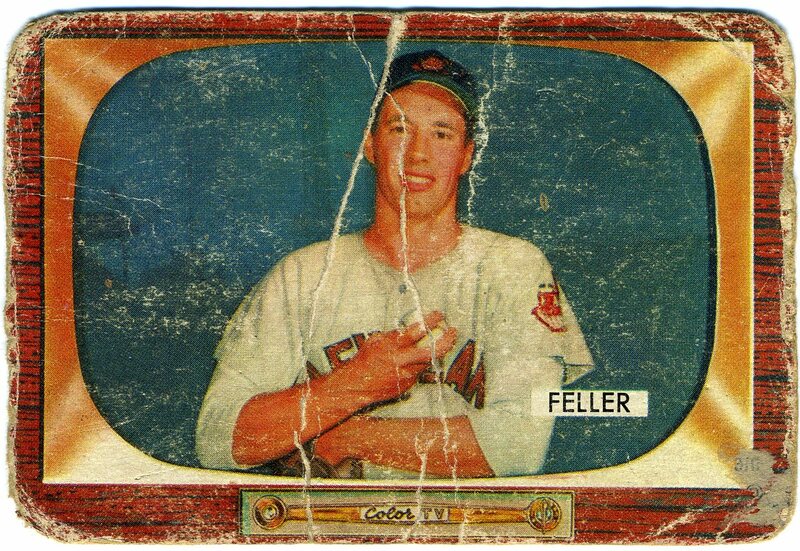 So it's Memorial Day and what better card to post than that of a real hero: Bob Feller. 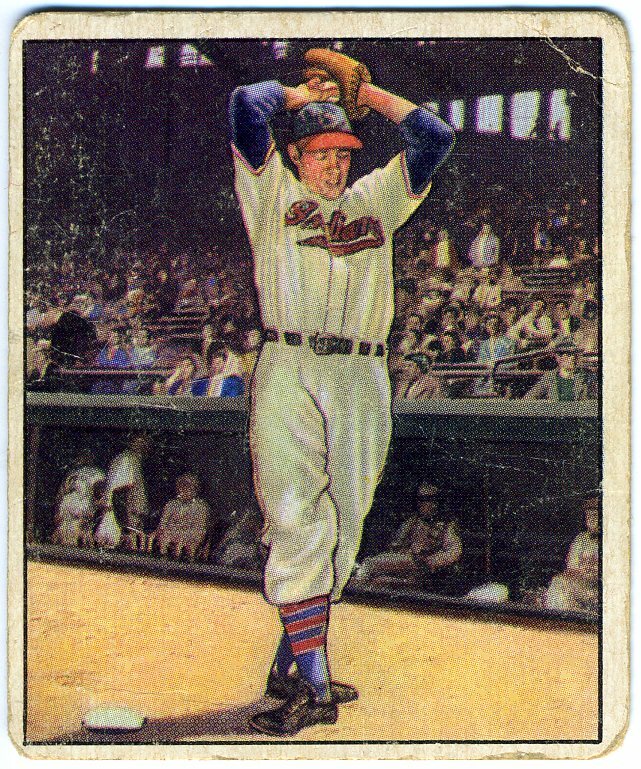 Feller enlisted in the Navy the day after the attack on Pear Harbor and served aboard the USS Alabama as a gunner. 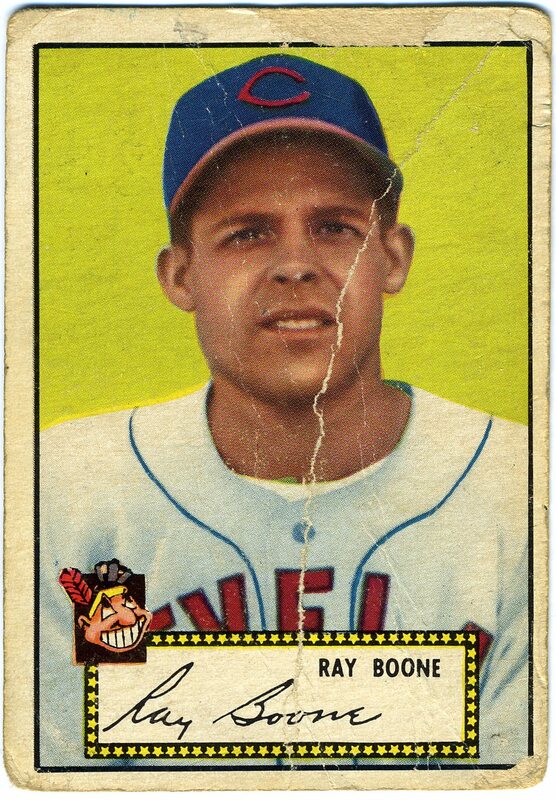 He served from 1941 -1945, missing four prime years of a terrific baseball career. Feller is not the only player to serve. A special thanks to all who served this country, ballplayer or not. 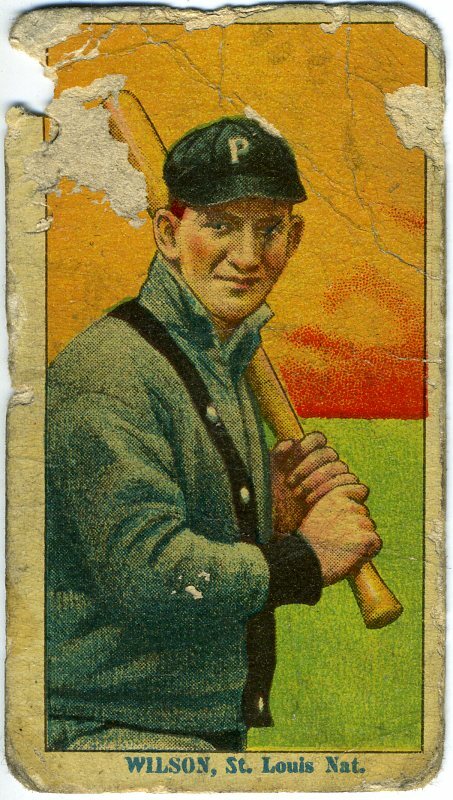 Yesterday was the three-year anniversary of my first post here at Poor Old Baseball Cards. It's been three years since I decided to begin posting baseball cards from my little corner of the collecting world. Before that first post, I remember asking myself if anyone out there would be interested in seeing my beat-up old cards. And sometime I still wonder. I've gotten a few of e-mails from some of you out there who who share my passion for these old pieces of cardboard. And for those I am grateful. Sometimes it's hard to get to the computer and add a new entry. Especially when your posts seem to fall on blind eyes and you continue to ask: "Is anyone out there reading this thing?" But sure enough, someone will give you a hint and tell you it's time for a new entry. Some of you out there also have blogs. And I don't need to tell you that it can be frustrating when no one comments or when you don't get feedback. I know readers are thinking: "No one cares about what I have to say." Well I do. If you see a card here you like, let me know. If you see a mistake, let me know. If you have a similar card, let me know. And by all means, hit that comment button. Let me know. It arrived yesterday. I had been waiting for nearly a week and it finally made its way into my mailbox. How cool is this card! 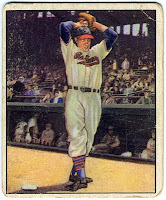 I'm a big fan of Goudey in general and this1934 card is a favorite. And a Hall-of-Famer nonetheless. Check out that lime-green and blue coloring. 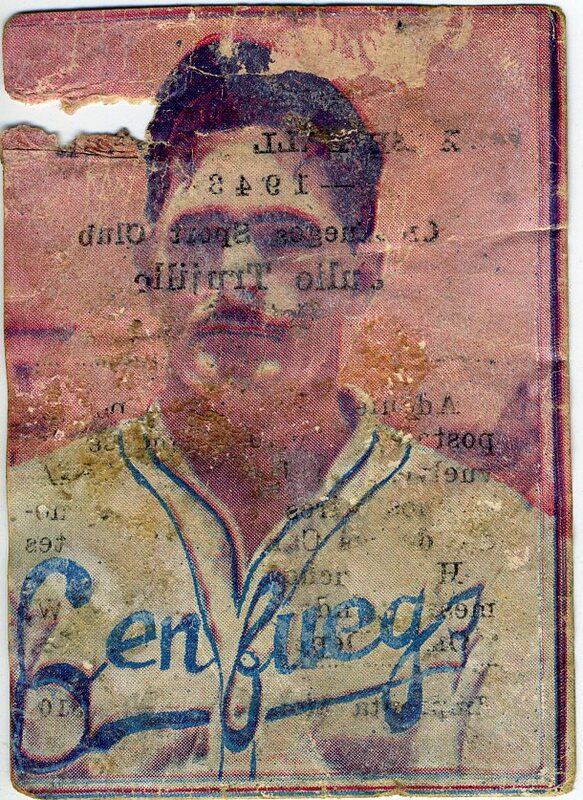 I love how the 1934 Goudey has a little note from the great Lou Gehrig. For the record, cards 80-91 had a quote from Chuck Klein. There are 96 cards in the set. 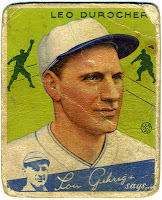 Durocher is best known as a manager but is shown here as a shortstop for the St. Louis Cardinals "Gashouse Gang." His scrappy play helped inspire the nickname as the Cardinals went on to win the World Series in 1934. He died in 1991 and was inducted into Cooperstown three years later. He has the fifth most career wins as a manager with 2,009. Too bad his induction couldn't come a little sooner. 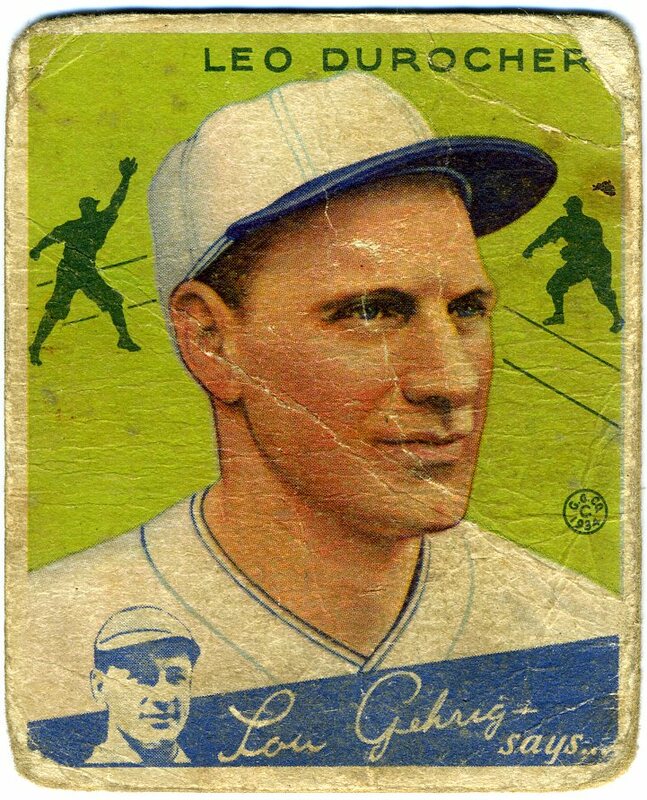 It's a good day when I can pick up one of these old pre-war cards. This is the first card of this set I have ever owned. The T-213 advertised Coupon Cigarettes and this particular sub-set offers 20 cigs for five cents. Chief Wilson hit 36 triples in 1912, a major league record. He was also the National League leader with 107 RBI in 1911 and hit for the cycle in 1910. The most remarkable of those numbers is the 36 triples. Ty Cobb hit 24 triples in a season twice. Willie Mays hit 20 in 1957. If you're looking for a record that may never be broken, you need not look much farther than Owen "Chief" Wilson. How could you not love this card? Its bright colors and unique color combination make the 1975 Topps set one of my favorites. 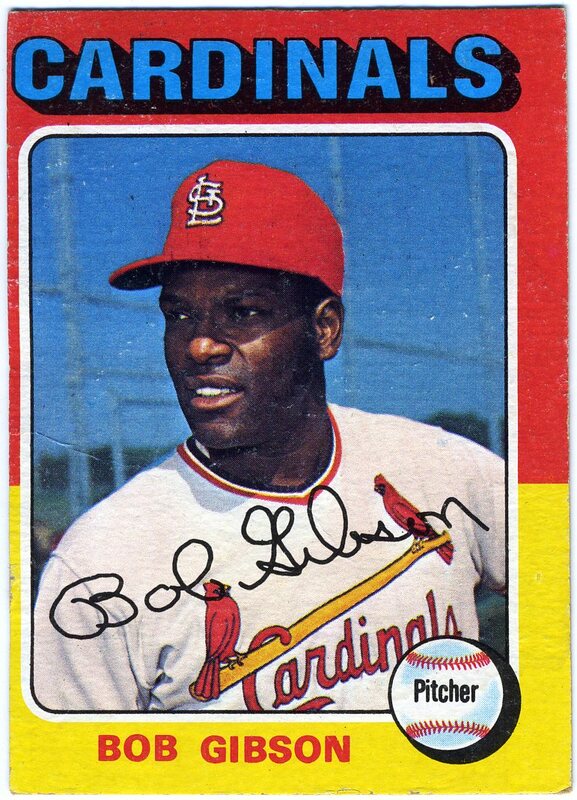 And what better two colors to use for Bob Gibson than red and yellow. If you are a parent, reading this post, do your kids a favor and get them an original card of one of the game's greatest pitchers. I got this one for a little over two bucks. Gibson was a fierce competitor. Could you imagine him playing in the 2011? There would be quite a few sore players walking around. Hint: After hitting a homer, don't showboat. Put your bat down and run the bases or you may be the recipient of a fastball in the ribs your next time at bat. Today, both batters and pitchers seem to have no problems showing up their counterparts. Player routinely admire their long fly balls and pump their fists after a strikeout. In the 60s and 70s, Bob Gibson and Don Drysdale would have none of that. Unless you wanted one in the ear. It's a Reggie Jackson baseball card ... or is it. 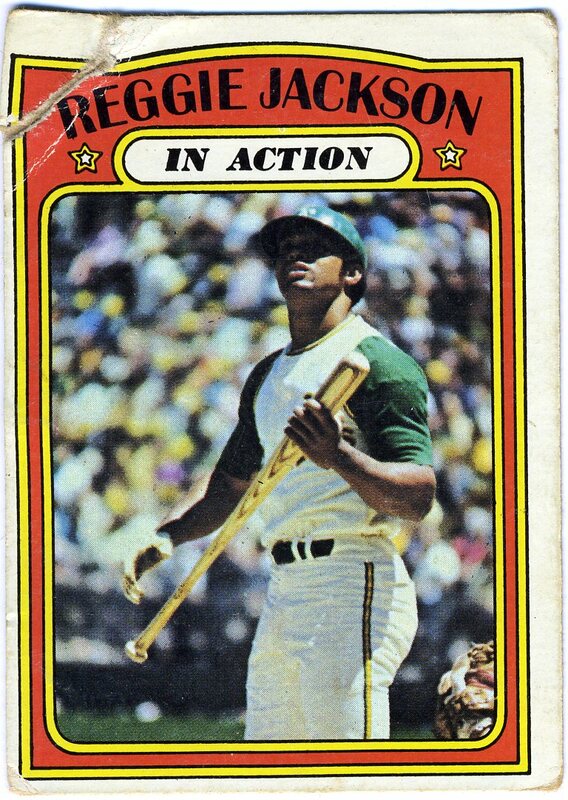 As I mentioned before, I could only imagine the disappointment when opening up that wax wrapper and knowing you could get a Reggie Jackson but having to settle for this In Action card. It's like expecting to see Cinderella but meeting one of her step sisters. One thing that must have disappointed more is getting no stats on the back. This card actually has a story about Hank Aaron hitting his milestone 600th homer. But at least it's Reggie, right? Sometimes the cards I post look worse than they actually are. This Tom Seaver card is worse than it looks. It has so many creases, I can't count. And those black borders don't help. Some people may wonder where I get these old cards. Since starting this blog nearly three years ago, I actually seek them out. The worse, the better. Believe me, I don't go overboard – at least in my opinion – this card probably cost a few bucks if you include shipping. Some may take pride in having a perfect card. Even borders. No creases or rounding. Perfect surface. For me, it's all about finding the worse card out there. The poorest of the poor. 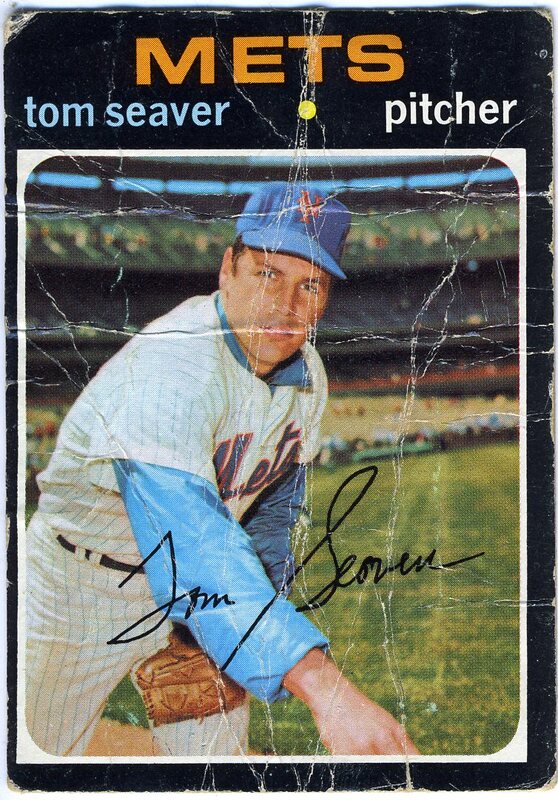 If you have a 1971 Topps Tom Seaver that has seen worse days than mine, give me a shout. It may be worth a few bucks. That writing you see across this Julio Trujillo's face is actually on the back of the card. The card is so thin, the writing is poking through. Sometimes, we think that Baseball is an exclusively American sport. But in 1943, baseball was big in Cuba. 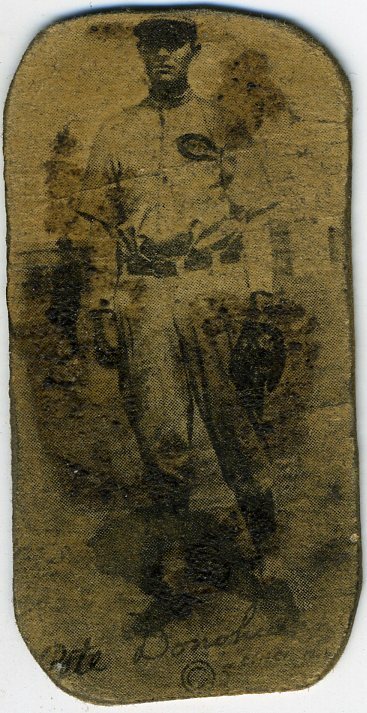 This Cuban card features one of many amateur players in this set. It took me a while to figure it out but it says Cienfuegos across Trujillo's chest. I figured this was a mascot but I was wrong. Cinefuegos is actually a city on Cuba's southern coast about 150 miles from Havana. Vicente Romo was elected to the Hall of Fame in 1992. The Mexican Baseball Hall of Fame. Romo piched with the Indians, Red Sox, White Sox, Padres and Dodgers. 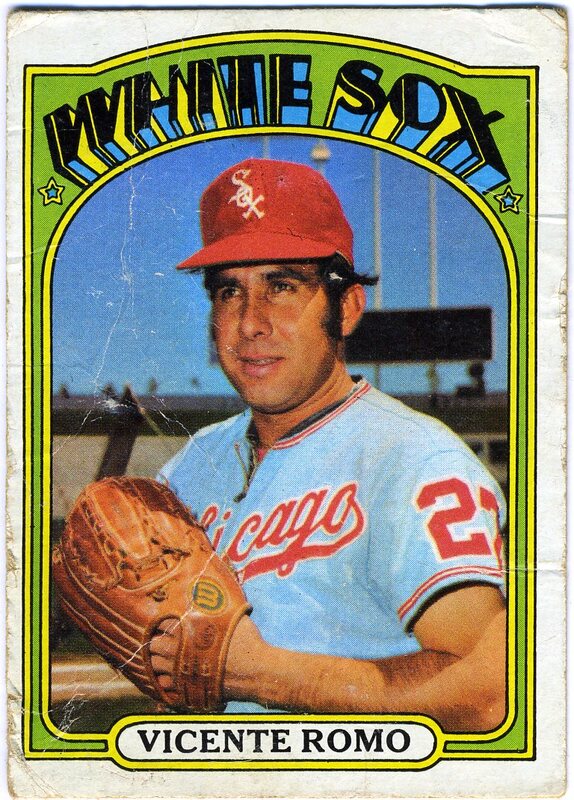 He had a 32-33 record with 52 saves and 416 strikeouts in 335 games. Not exactly Hall of Fame numbers. While researching the righthander, I learned his nickname was "Huevo" or egg. I don't know why but I would venture to guess that his noggin had something to do with it. Wow! Take a look at that hat. I met Bob Feller last July while attending the All-Star FanFest in Anaheim, Calif. I stood in line with what seemed to be a thousand others waiting for an autograph. I remember talking to the guy next to me in line as we were wondering about Feller's age. We recalled how he pitched in the 1930s. He had to be pretty old. When I got home I realized he was a rookie in 1936. He pitched against Lou Gehrig and just missed playing with Babe Ruth. He was 91 when I saw him. Sadly, Feller was in his final days. A month later, he was treated for leukemia before celebrating his 92nd birthday in November. He died in December. Another one of the game's greats gone. Now this one's pretty bad. First, it's badly trimmed. But when it comes to these old strip cards you need to be a bit forgiving. Remember they came in strips of ten and had to be cut apart. You rarely find the borders in perfect condition. But this card is far from perfect. There is also a raised stain on the card. Is it chocolate syrup? Motor oil? I'm not sure but it's definitely on top of the card. What a mess! As for Pete Donohue — he had a 12-year career earning a 134-118 record with the Reds, Giants, Indians and Red Sox. With all its problems, this card till a great old baseball card in my book. 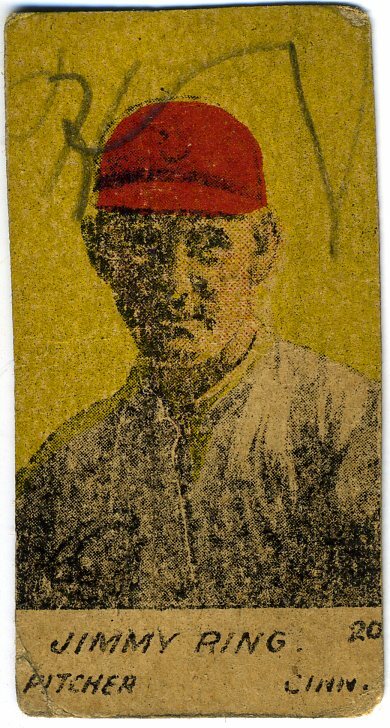 Jimmy Ring was probably best known as a member of the 1919 World Champion Cincinnati Reds. You know, the team that beat the heralded Chicago White Sox. The Black Sox. Eight Men Out. Ring beat Eddie Cicotte in Game 4 of the World Series 2-0. Cicotte was 29-7 with an 1.82 ERA during the regular season. When I was younger, these old strip cards provided me with a way to get a card of a star player at an affordable price. I remember getting my first strip cards in the late 1980s. I think I got a Babe Ruth, Ty Cobb, Walter Johnson, Rogers Hornsby, George Sisler, Wally Pipp and Jess Barnes for about $50. Good luck getting Wally Pipp alone for under $50 today. I still enjoy finding these cards on places like eBay. This example set me back about $7 — and it's the rarer W516-2-2 version. Just in case you were wondering there were three variations of this set. 516-1 were hand lettered and had a normal image, 516-2-1 had a reversed image and typed lettering, 516-2-2 was reversed and hand typed. It really doesn't matter which variation you get, these old cards are a great addition to any vintage collection.